Hi I'm Boots. 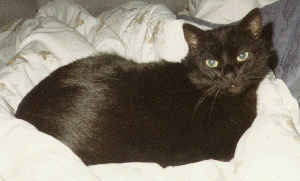 I waz born feral but my cat-family abandoned me in the heat and humidity of the summer of 1996. I wuz living with them in our colony when all of us - my brothers, sisters and I got real sick. We were playing outside the fence on the sidewalk but I couldn't play anymore. I too had a horribul infection in my eyes. Plus I wuz sufferin frum dehydration, that plus my infection had my eyez almost swollen shut. I had them ear mitez as well az wormz. I wuz just so tired that I laid down onna sidewalk. My cat-family left me there and went back to the other side of the fence where our home wuz. All of a sudden, this dog came right up to me and I wuz soooo scared of him. His nose wuz longer than my whole body. But I wuz too weak to run away. He wuz with this human male who picked me up and took me inside with them. I wuz still furry scared. The human, who turned out later ta be my human Dad, washed me up and discovered that I wuzn't a dark gray kitty, but a mostly white and gray kitty. I didn't like that washing part at all though and he wuz lucky that I wuz too weak ta fight him. Then he put some drops in my earz and also in my eyes. I could smell the food that he wuz tryin ta give me, I just wuz too weak ta eat it. Another human came into where we were, she later turned out ta be my human mom. She gave me drops of warm milk usin a dropper. They furst hadda shove that thing in my mouth cauze Ize didnt know what they were tryin ta do ta me. Then when I tasted it, it wuz okay! It only took me a couple of days ta be able ta open my eyez allaway. I got my appitite back purrity quick too (and it haz never left me since). Ize had a complete recovery and a clean bill of health from TED. Ize love my home. Ize love my big brother Orion, heze really good ta me. And Ize have a furry speshal place in my heart fur my brother Merlin the dog. Ize like ta follow him around sometimez and I sleep wif him every night. My name iz Orion. 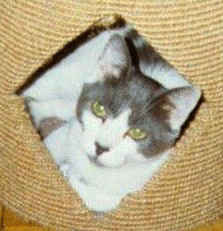 Ize rememfur most of what happened ta me, before Ize came ta live wif my hoomins, but not all of it. It wuz December 1993, the furrry end of the year. And it wuz real, real cold onna streetz of Brooklyn in Mew York City. It had been a furry cold winter so far and it seemed to have started earlier than usual. I had been born in a feral colony which resides in an abandoned lot across a big, big street frum where I now live. I wuz in purrity bad shape. My right eye wuz missing and all that wuz left wuz a nasty infection. I wuz too skinny and had bugz in my earz. I could see real good with my one eye, though. I saw across the street frum our colony wuz a place that had lots of humans coming from and going to it. I later learned this is called a store. I had heard rumors that there were some good humans and that they would take you home if you were cute enough. I wuz about 8 weeks old already, but I figured I still had *some* cuteness left. Anyway, I had to get out of the cold, somehow, I had to get across the big, big street and get to that store, in the hopes of findin some shelter an warmth. Ize don't rememfur how Ize made it allaway across the big, big street wifout getting hitted by any moving metal monsterz, but I did. I found myself in front of the store huddled under a steam pipe tryin ta get shelter frum the cold bitter winds. I sat under that steam pipe and meowed at every human I saw. It must've been hours...I wuz ready to give up - no one had even noticed me. And then I saw him, he looked kinda nice and so, I meowed really loud. He looked at me, bent down and scooped me up. I couldn't believe it! I wuz a bit scared, but it wuz nice and warm in his arms. He took me to the IN and that's where I met my human Mom. He said to her, "look what i picked up for you at the store, hon." Then she saw me and held me and weze been bonded ever since. I took my furry furst nap here in her arms. I wuz scared of Merlin, my dog brother, at first, but once I realized he wasn't gonna hurt me and that he just wanted ta play, I wuz fine with him. They nursed me back ta health and though I don't like TEDs at all, I must say the one they took me to gottid me all better. Ize been livin here ever since then. Ize a regular house cat now and I love it. I was borned on a farm in Germany in 1985. Da farm was next to a furry busy road, so'z the farm lady was afraid I wuld run unner a car. 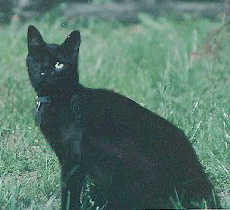 She called my meowmie an tole her dat dere's a liddle black kitty runnin around da farm dat kuld use a home. Meowmie drove da hour anna half to da farm an spent all day tryin ta katch me. I played hide-an-seek wid her fur da affernoon, den I decided I'd let her take me home. Da car ride wuz horrible. I cried an cried an cried... Meowmie wuz in tears when we gots home finully. Da next day meowmie's friend called an said dat her black kitty wuz still around, but dat da neighbor wuz one kitty short. Meowmie wuz furry embarrassed, called da neighbor an traded me in. She said no way wuz she goin on anuffer car ride wid me. So I gots to stay! Den I gots furry, furry sick wid sumfing like a kitty feaver an kold. I dinn't eat an wuz so skinny inna end dat I falled offur when I walked. Meowmie taked me to da TED effury day to giff me booster shots an vitamins an all kinds of injekshuns. Meowmie taked da week off frum werk cause she dinn't wanna leave me alone fur a minnit. Also, da TED tole her dat she needed to force-feed me effury hour so'z I wuld survive. Her eyes leaked a lot in dose days, an she kuddled wid me alla time, she wuz so afraid to loose me. It taked a lot of TED visits an about a week an a half, den I toddled offur to da fud bowl fur da furst time on my own. Dat's when meowmie breaked down an kudn't stop crying. We both hasn't looked back since, an we'ze furry furry close. Den meowmie gots me a liddle sisfur cause she said I haz enough love fur a whole truckload of kitties an needed a cumpanion. Dat's how my sisfur Gina joined da fambly. Den meowmie found me a daddy. She tole him dat he wuz gettin a fambly or nuffin, an he settled for da fambly opshun. Not only dat, but he dopted our neighbor's kitty when dey decided dey didn't want her anymore and wuz goin ta take her to da pound. Dat's how my sisfur Daisy joined da fambly. Hello. I'm Kelly. I'm from Australia. People fink Australia is always lovely and warm, but down the south in Melbourne it certainly isn't. In winter, it's freezing freezing cold - well, it is when you haf to liv on da streets. I spent at least a whole winter living on da streets of Springvale, which isn't quite da middle of da city, but was quite bad enuff, fangu furry much. I found out that livin' on the streets makes you furry furry thin and cold and hungry, especially if'n you're raising kittens at da time. I also found out that Macdonalds hamburgers and KFC chicken don't make a furry good diet for 18-month old kats. I don't rememfur how ling I lived on da streets, but it was at least da whole winter. Then, in October 1996, a sensible hoomin bundled me up and took me to the Cat Perteckshun Society. By then, I was incredibly thin and rather sick and furry, furry tired. The CPS people gave me shots and vitamins and baths and told me I was an amazin' cat once I got cleaned up. Then they fixed me even-though-I-wasn't-broke - although I fink I might have been broke by then - and innerduced me to a huge pen full of uvver kats. I spent a couple of weeks there waitin' for the right person to come along who would appreciate me properly. Then one day I saw these PURRFECT people walking past. They wuz so purrfect, I went and sat at the pen door and STARED at them. I'm furry good at staring. She said "Oh, look at the one with the enormous green eyes staring at us!" and picked me up. So I started purring. I curled up in Meowmie-to-be's arms an' purred an' purred. Then I crawled up her arm and around her neck and purred some more. Prr-to-be laughed and said "I think you've found the cat you want!" and Meowmie-to-be said she would just go to look at all the others and make sure, but she thought so too. Then she put me down, and I went and curled up in a corner to wait for her. She came back - of course! - and I FREW myself across the pen to her an' purred an' purred an' purred. And Meowmie turned to the CPS purrson and said "We'll go home with the tortoiseshell with the amazing long bones and the ENORMOUS green eyes." That wuz me! I luv my home. It's in Box Hill, and there's a garden out the back I go and play in each day, but not for furry long because I don't like being outside much without Meowmie or Prrr. I spend the time they're at work curled up inside dozing so I have lots'n'lots of energy for when they come home. I would play with the TashaCat, who was there when I came to live there, but I don't fink she loves me furry much. She's always trying to chase me and growl rude things to me. Still, we get on pretty well. And when Meowmie's home in the garden I go and climb trees and race up and down fences and explore the roof, which is funfunfun. I'm not all ribby any more, but I'm still a thin, thin kat with amazin' long bones. Meowmie says it's unfair that I can eat so much and stay so slender. And I still haf the most ENORMOUSEST green eyes anyone has effur seen! And I'm so happy I purr all the time, wifout stopping, which is why effuryone calls me Kelly-wiv-da-broken-purr-motor - da volume knob works, but da on/off switch is jammed on! 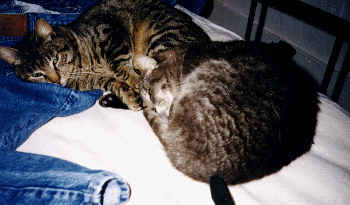 Dis is a pikture uf us sleepin' onna bed. Stripey's onna left 'n Iz onna rite. Its furry hard to tell our storeez, cuz Meowmie is typin' fur us, and we dont want her to know how we ended up at the kitty-jail pound(it would only upset her). I (Squeakey) wuz ina kitty-jail pound, 'n a hoomin named Mark tuk me home. All I wood do wuz hide unner thuh bed, so Mark desided to get me a liddle friend. So he went back to the kitty-jail pound 'n brot home Stripey! Effur sinse then, we haff been a team, neffur to be parted. The only thing Mark new about us wuz that we were boff 'bused kitties. Becuz ov our 'speriences in the out befur Mark gotz us (nobody nos whut these 'speriences were, and we'r not telling! ), we ar furry afraid of hoomins. Haff of my ear is missing - somethin' musta cut it, cuz itza clean slice, not torn as if it wuz a aksident. Stripey's collar wuz too tite, 'n so he hazza big head 'n a liddle body. 'N I hazza scar right next to my liddle pink nose. Meowmie sez it looks like a freckle! As if we hadnt had a hard enuff life so far, Mark 'bandoned us - he gotted a d*g 'n wuz neffer home anymore to five us our dins! So Stripey tol' me there were some nice hoomins next door that hadda liddle black kitty, 'n maybe they wood haff some extra fuds fur us. So I gathered my curidge 'n we went next door ta humbly ask fur help. They felt furry sorry fur us and they made shure there wuz always fresh fuds out fur us. We'd come offur fur brekfist and dins. But we wuz still afraid of them - cuz hoomins are scary (they still are! 'Sept Meowmie 'n Pawpa). But then one day, we decided to 'dopt these hoomins fur ourownselves. We stopped running frum them and let them pet us while we wer eating. Then we sealed the 'doption when I finally flopped on my back to get a tummy skritch! Our life is full of live and security, and we get 2 meals a day, (brekfist 'n dins) and a tummy skritch weneffur we want!